This new version does not use custom entities anymore. 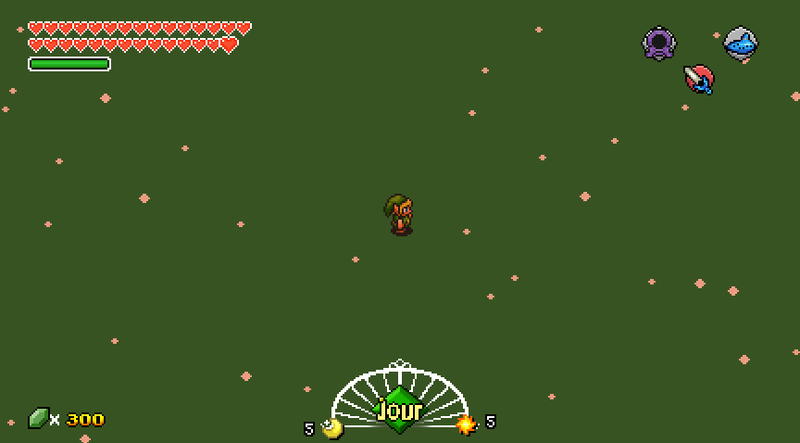 It draws all rain drops on a surface, and only 1 single sprite is used for all the rain. There is also the storm mode, which is more spectacular. And the best of all is that the transition between the 3 modes ("rain", "storm" and nil) is smooth. The script allows to modify the rain mode of the current map, and also to attach a rain mode to certain world (the rain is automatically started when the hero enters that world). Note that there may be future changes and improvements for the code of the script. -We will have a snow script too, maybe for next winter holidays. -I am considering to make a "frog" mode where it rains with frogs too. Maybe for April. Some issues have been fixed for the rain script. I think it works fine now. - For lightning strokes, I suggest you to use white instead of yellow, or a very pale yellow, close to white. Then draw this surface with a special blend mode like "add" (not multiply), to change colors while keeping shapes. - Using semi-transparent dark grey/blue as a surface, in "multiply" mode. Make the transparency vary a bit, to simulte a dark cloudy atmsophere. @Neovyse: Thanks a lot for the feedback! I have updated the files to add all your suggestions. -Water and lightnings are now white, and water has more transparency. -Storms add a dark surface drawn with "multiply" blend mode. Smooth transition when it appears/disappears. -The "add" blend mode for lightnings make them look great (much better now!). Yes, snow should not be harder than this. But better to make it in a different script because the rain script is already very complex due to the smooth transition between different rain modes (the rain drop number and their properties, and the darkness value, vary very smoothly). If you can wait for Christmas holidays, I will probably make the snow script for then. I think all problems are now fixed. And more customization has been added. Current version may be the last one. Ahoy there @everybody! There is already a usable version of a SNOW manager too! The code has been adapted from the last version of the rain manager. It is not the final version yet (it will be updated): there are things to do, like adding transparencies to the snow flakes that vary with the time, and also for when they have fallen to the ground (they should disappear smoothly). And maybe other small details. Note that the current version of the snow manager is already far superior to the one of RPGshit RPGmaker. I would like you to test it and give me some feedback. The snow script is now finished!!! -It adds now dynamic transparencies to the snowflakes. -I have also fixed some minor issues with the rain and snow scripts. Feedback is welcome (and mandatory!). It is much better now, this is awesome, thanks for this awesome script !